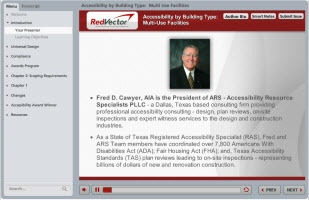 RedVector is excited to announce the launch of a brand new, mobile-ready eLearning course on Accessibility in Multi-Use Facilities! This one-hour course will address the design and construction of multi-use facilities using the requirements of the 2010 Americans with Disabilities Act (ADA) Title III Regulations Accessibility Guidelines – ADAAG, effective and mandatory for all such buildings and sites in the United States on and after the 15th of March 2012. You will experience a “virtual” tour of the newly renovated Texas A&M University – Memorial Student Center (MSC) in College Station, Texas by the State of Texas Registered Accessibility Specialist (RAS) of record – both exterior site and interior portions of the additions and renovations project. This presentation will discuss the myriad accessibility issues that had to be met during design and construction and will address the “above and beyond” selection criteria used by the APA / TGCPD Accessibility Awards Program – a joint program between the Accessibility Professionals Association and the Texas Governor’s Committee on People with Disabilities. identify specific technical Chapters 3 through 10 and sub-sections of the 2010 Americans with Disabilities Act (ADA) and the 2012 Texas Accessibility Standards (TAS) accessibility requirements – that must be addressed during the design and construction of multi-use facilities; coordinate both exterior site and interior accessibility elements in both new and additions & renovation projects – that must meet the civil rights (ADA) and State & municipality requirements to not deny access to people with disabilities; list accessibility issues that must be addressed during design and construction – that will protect the life safety and public welfare of people with disabilities; understand the accessibility/usability selection criteria that goes “above and beyond” the standard physical needs of people with disabilities – by using “people first’ language.